Fog may be one of the more static weather conditions to photograph with rarely any dramatic changes in the scene from one minute to the next. But the situation is slightly different when you are sitting 400 metres on the top of a mountain. Depending on how high up you get, you'll usually find bright sunlight with the layer of fog sitting down below you hill. Next to the Freedom Square you can find one of many construction sites around the Simon Fraser University campus with a new 110,000 square feet Student Union Building being built. 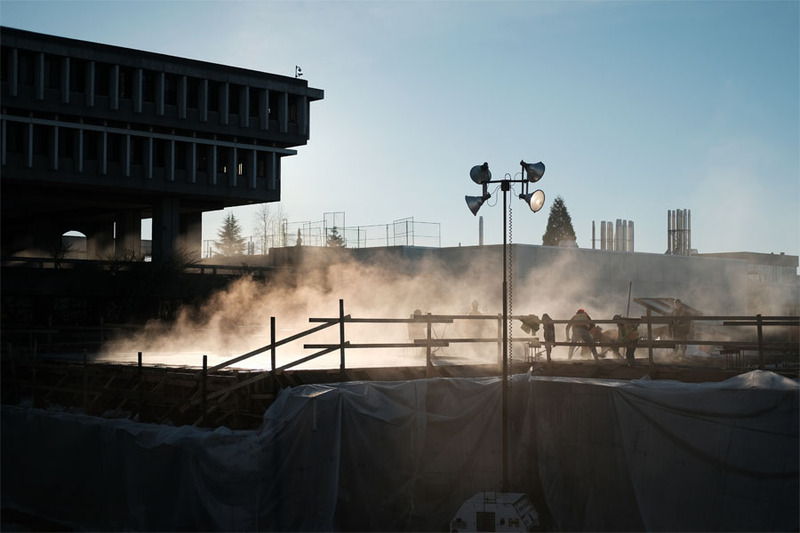 Here is a short photo set from the campus that centers on a set of photos taken over fifteen minutes as a fog bank passed through the construction site.